I am feeling quite behind in blog publication. Every day I feel pressed to get something up but don't end up doing so. Rather than wait any longer and add still more to my collection of daily notes and beginnings of entries, please allow me to express to you briefly some of what has been going through my mind here in Jerez lately. There are many things I wish to write about how flamenco permeates this city. Like how just this afternoon on my way home from bata class with Mercedes I heard an old guajiras recording playing as I walked by a house on La Calle Duende. Or how yesterday during siesta on our way to meet a friend for afternoon café the two little boys walking in front of Diana and me were discussing fútbol when suddenly and seemingly without any awareness of it one started doing palmas and singing never losing sight of the conversation he was having with his amigo. Junquerita, who often comes to sing for our bulerías class told me that here in Jerez the scent of flamenco is everywhere. There is no need to go looking for it. That may be an understatement. More accurately it seems flamenco is impossible to escape in Jerez. 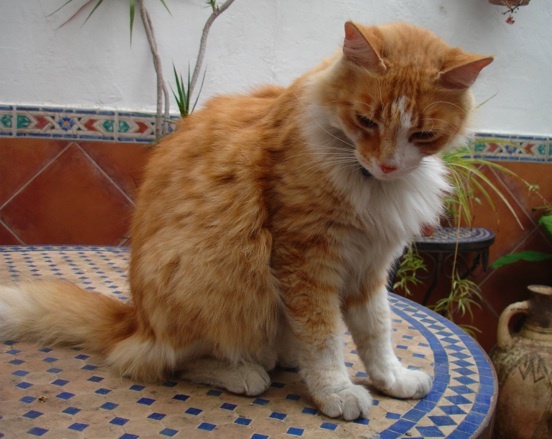 I think even the cats here do flamenco. I know Lailo the one from my apartment does. In fact, just the other night I heard him singing in the callejón. Last night I asked Fran from the little bar on the corner here in San Miguel - where he's worked all of his life along with his parents - if everybody from Jerez could do at least some flamenco. In his opinion the answer was yes. I have asked this question of many people here. Angel, the handy man at our last apartment, told me about how he didn't dance bulerías much but that he did play palmas pretty well. When I asked Pepe, Diane's boyfriend who is from the Barrio de Santiago if he did any flamenco, he answered no then proceeded to describe to me the difference between bulerías de Santiago and bulerías de San Miguel. And how he didn't really dance bulerías, just at the fería por ejemplo. Um, okay, I guess we have different definitions of what doing flamenco means. I am in a flamenco town amongst flamenco people, yet it seems so many don't realize how much they know. Yesterday in class I commented to Carmen, assistant teacher to Ana María López, on her ability to sing, do palmas and dance bulerías all at the same time, "Pero eso se hace todo el mundo," she told me. "En tu mundo," I responded, "but not mine!" Last night after class at Chiqui's with Rocío who was substituting this week, I stopped by the Peña Los Cernícalos where I have my bulerías class in the morning. I got to the top of the staircase and saw el Periquín, 'Niño Jero,' hanging out at the bar with chatting with another man then later overheard him playing his guitar in the other room while I talked to Junquerita. I went there to watch Ani's class for the older people of Jerez. This is a class for people who have grown up hearing bulerías their whole lives, and they're STILL struggling to understand this complex palo. Yet the whole time they're having so much fun, calling out jaleos while they move. Actually, it seemed less like a class and more like a juerga. "Es que la bulería tiene mucha guasa"
"Bulerías is so tough." Carmen, a student there said to me after struggling to execute her going off step and make it work correctly with the cante and the compás. And this is just one of the many classes designed specifically for people from here. Yesterday I received a text message from Mercedes, a Jerezana from my teoría class, asking if I wanted to go to observe her private bulerías class with Manuela Carpio tonight. If even the people who are from Jerez have to take class to understand bulerías, how could I possibly ever master it? And just now after writing that I realize, mastery is not necessary. I can continue to enjoy the process of studying it.